Jennifer J. Wilhoit, PhD is a spiritual ecologist, the founder of TEALarbor stories, and the author of books, articles, and blogs focused on the inner/outer landscape. 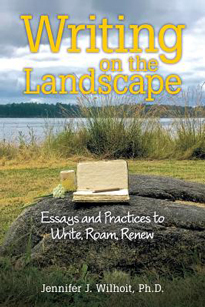 Her book Writing on the Landscape: Essays and Practices to Write, Roam, Renew (2017) offers aspiring writers a way through some of the challenges that come with writing, including difficulties in daily life that impede progress. Writing and nature-based practices over time can more deeply connect us to the earth and to ourselves, thus enhancing our written outcome. This book uses rich language to inspire anyone compelled to write or live more fully in connection with self and nature. It is a practical, lyrical book aimed at helping blocked writers to become unstuck. Wilhoit brings joy to writing through her own revelations: "I am in love with writing; writing seduces me. I am in the landscape of my soul. I write from the very core of who I am. That is what the natural world does for me and for my writing no matter where I am."